This heavy duty outdoor cover is 100% waterproof yet breathable via roof special covered vents to allow damp & moisture to escape. Features double stitching for strength, non-scratch latest generation material in a silver colour and is elasticated front and rear. The fabric is 100% UV resistant and protects against rain, frost, snow, birds, tree sap, sunlight, dirt & dust. Supplied in a strong zipped storage bag, this cover takes up very little space and can be tucked away easily when not in use. Sturdy detachable underbody straps are provided, so however stormy the weather, you know your car is secure & protected from the elements. 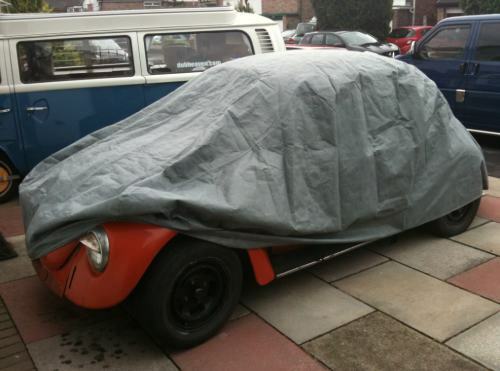 We have tailored covers to fit all Beetles of all ages and styles. Simply select your model from the drop down box below. They are not a universal cover as offered elsewhere, they are a custom fit! Depending on the year of your beetle will deturmine its size. 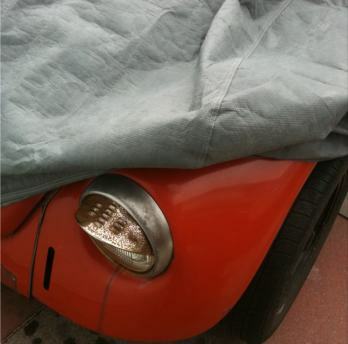 Ie smaller early Beetles with flat windscreens mean we supply a smaller fully tailored cover with no wing mirror pockets, Later Super Beetles requires a slightly bigger cover again with no wing mirror pockets. This is important as because of the shape of the beetle, if the cover doesnt come all the way down, front or back, then the cover may blow up if the wind gets under it.